No to more Imperialist Wars in Pakistan, Syria & Iran! As part of Israeli Apartheid Week 2012, the Ireland-Palestine Solidarity Campaign is honoured to host a talk and film screening by Iyad Burnat, a leader of the Bil’in Popular Committee Against the Wall. 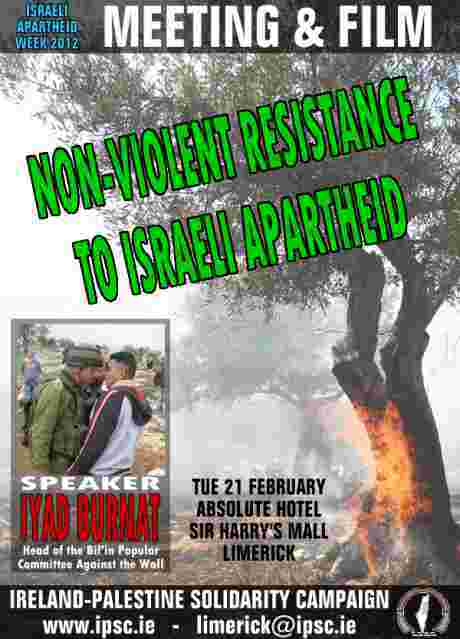 Iyad will talk about the ongoing civil resistance campaign, both in Bil’in and in other areas like Nabi Saleh, Nil’in, Budrus and Sheikh Jarrah. Born in 1973, Iyad Burnat is the head of the Bil’in popular committee and Friends of Freedom and Justice and will be a familiar figure to the many Irish who have travelled to Bil’in over the past number of years. 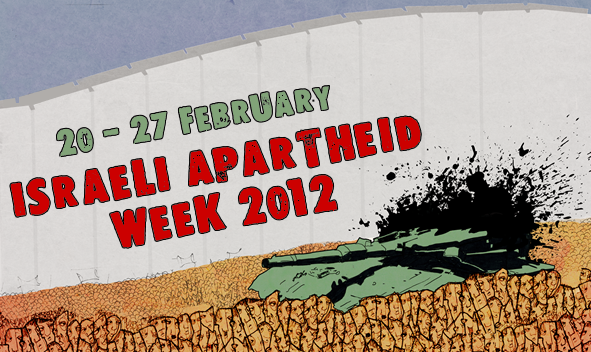 As part of Israeli Apartheid Week 2012, on Friday 24th February from 1-2pm the IPSC will be holding a small demonstration outside EU House, Molesworth Street (Dublin 2) to highlight the European Union’s ongoing facilitation of Israel’s apartheid policies and war crimes. In particular we will be highlighting the role of Irish EU Commissioner Máire Geoghegan-Quinn, who is responsible for administering “scientific grants” to Israeli arms manufacturing companies and other Israeli businesses and institutions (including settlement-based Ahava), effectively amounting to rewarding Israeli for its terrorisation of the Palestinians people. 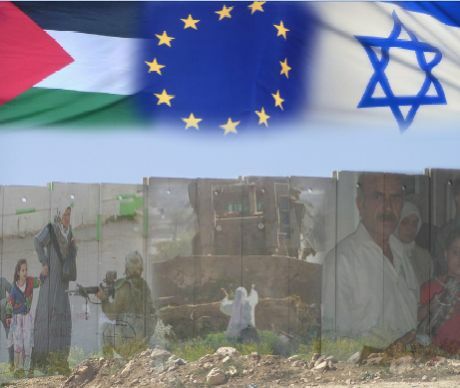 For background to the EU and Israel, please see the relevant section of our website here. This event is organised by the Ireland-Palestine Solidarity Campaign (IPSC) as one of a series of events taking place around Ireland during international Israeli Apartheid Week 2012 (20 – 27 February). As part of Israeli Apartheid Week 2012, the Cork branch of the Ireland Palestine Solidarity Campaign will be holding a demo and march calling on consumers to boycott Israeli products until Israel ends it occupation of Palestinian lands and abides by its obligations under international law. Assemble at 1pm in Daunt Square, Cork City. This action is part of a National Day of Action, with similar events taking place around Ireland on the same day. As part of Israeli Apartheid Week 2012, the Dublin branch of the IPSC will be holding a “rolling boycott” demo calling on consumers to boycott Israeli products until Israel ends it occupation of Palestinian lands and abides by its obligations under international law. 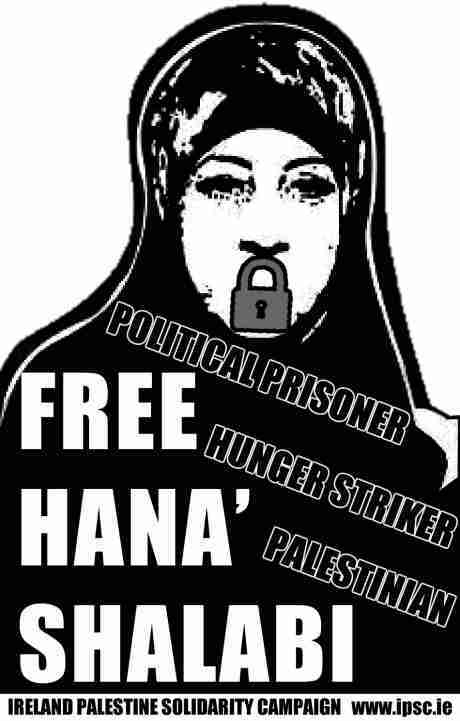 We will assemble at 2pm outside Dunnes Stores on Henry Street (famous for its role in the 1984-87 South African Anti-Apartheid strike by Dunnes’ workers), and begin leafleting and engaging with shoppers. From there we will visit the Jervis Shopping Centre on Henry St, Aldi on Parnell St, and wind up outside Tesco on Parnell St all of whom stock Israeli products. Responding to the Palestinian call for organisations to announce International Women’s Day to be a day of solidarity with the administrative detainee Hana Al-Shalabi and all female prisoners and women in the families of Palestinian prisoners, the Ireland Palestine Solidarity Campaign is holding a solidarity vigil at the Spire on O’Connell Street, Dublin 1 from 4.30 to 6.30pm on Thursday 8th March.